Getting rid of ants can be a full time job. It seems like every time you get rid of one line of ants another one shows up. Bug repellents can work, but they also leave trails of poison all around your kitchen. Instead of buying expensive bug repellents, a few household items will help you get rid of your ant problem once and for all. The number one top all purpose cleaner, white vinegar, also keeps away ants. Wiping down all surface areas with a 50/50 mixture of white vinegar and water wipes away the scent trails that ants use to get from place to place. Another way to get rid of ants is to spread a line of baby powder, or plain talcum powder, where the ants are getting into your home. Theirs no fancy science behind this method, ants just hate talcum powder, and will stay away. 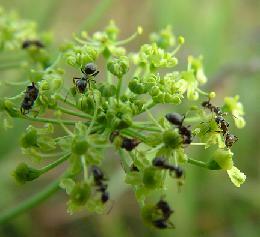 Certain spices and herbs have strong scents that repel ants. Leaving these spices in ant trouble spots will keep them from coming back. Some ant repelling spices are; cinnamon, chili, black and cayenne pepper, cloves, garlic and mint. With these simple, all natural household items, you can win the war on ants. He was totally right. This post truly made my day. Thanks!